The Ebola epidemic exposed, and was fuelled by, a number of weaknesses in the health systems of affected countries. In many cases, governments were already aware of these issues and planning solutions. In the aftermath of the epidemic, the time to address these problems is now. Medical and diagnostic laboratories play a central role in an emerging vision of rebuilding resilient health systems in Guinea, Liberia and Sierra Leone. National leadership has been at the forefront of efforts to rebuild; the governments of Guinea, Liberia and Sierra Leone made public their plans for recovery at the International Ebola Recovery Conference in July of 2015. The delay between the emergence of cases of Ebola virus disease and the start of national containment efforts reflected a shortage of diagnostic laboratories and a lack of surveillance and reporting structures at the national and regional levels. The lack of any surveillance system, either local or integrated between countries, contributed to the escalation of what initially seemed to be a containable outbreak. Intensive investment in laboratory testing, contact tracing and screening was crucial for establishing control over the epidemic. In its wake, establishing a sustainable programme of integrated disease surveillance and response (IDSR) is a priority for the prevention of Ebola re-emergence. IDSR is a flexible system that can be used to monitor and control the spread of other infectious diseases prone to outbreak. As national officials and international partners build IDSR systems, they are also prioritising international communication about emerging threats and coordinated responses. In the transition from outbreak response to outbreak recovery, there will need to be an emphasis on improving the standards in peripheral laboratories in addition to regional facilities. Candace Eastman, CEO of Africabio Enterprises (AEI Global) in Liberia, notes that specific issues that will need to be addressed include accessibility, facility requirements to meet operational standards, inventory management, training, guidelines for consistency between laboratories, and a robust referral system. Robust national systems with wider capabilities will be better able to weather the shock of unexpected emerging infectious diseases in the future. As implementing partners conclude their clinical and diagnostic work, the equipment and supplies they have provided and facilities they have helped to build have the potential to become assets in a new, stronger health system. A first step, notes Dr. Amadou Sall of the Institut Pasteur in Dakar, will be to determine what equipment exists and where it can be used most appropriately. “Making sure new things are working and being used properly is a line of action people need to be working on,” says Dr. Sall, adding that maintenance for these assets will be key to building them into a sustainable national laboratory system. Efforts to rebuild and strengthen laboratory systems will have considerable expense. Ms. Eastman knows that governments will not be able to be responsible for the necessary financial investments alone. “We need to start to think creatively,” she states. 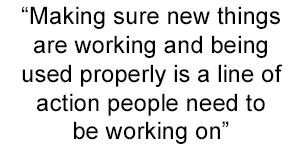 She mentions public-private partnerships as a possible solution. These partnerships will be inclusive of all entities that have the expertise to bring about change, and can provide measurable results. All collaborative efforts, however, will be guided by local legislation and policy to ensure an environment of quality and standards in the delivery of healthcare services both publicly and privately. Concentration of health administration at the central level, with limited district or provincial level oversight, had led to inefficiencies in hiring and payment, along with slow communication between central authorities and local laboratories. Decentralising health administration is a priority for both more responsive surveillance systems and better human resources management. During the epidemic, the United Nations Development Programme (UNDP) coordinated salary payments for the doctors, nurses and laboratory staff in the path of the disease. As the crisis wanes and each country re-establishes its own health system, building a sustainable payment system is a priority. In Guinea, efforts are also underway to harmonise salaries between the national health system and other organisations.11 During the outbreak in Liberia, technicians abandoned laboratories all over the country following the death of six laboratory workers. Africabio Enterprises was the first to provide biosafety training to 25 laboratory technicians who had chosen to assist in the crisis when their colleagues abandoned the laboratory. The training allowed the technicians to renew their confidence in their ability to carry out work safely, and provided an opportunity to share knowledge on working in a crisis. This lesson is an important one for future laboratory workforce development,highlighting the need to build a culture where technicians know their lives are valued, and are empowered to confidently interpret results and solve problems. Originally published in the October 2015 issue of Lab Culture newsletter. 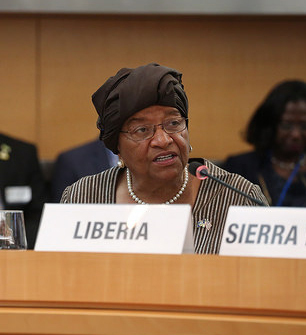 Ellen Johnson-Sirleaf, foreword to Investment Plan for Building a Resilient Health System in Liberia, 2015-2021. Bausch D. The year that Ebola virus took over West Africa: Missed opportunities for prevention. Am J Trop Med Hyg 92(2), 2015. UNDP. “Recovering from the Ebola crisis”. 2015. Investment Plan for Building a Resilient Health System in Liberia, 2015-2021. Chen ZL, Chang GH, Zhang WY, Chen Y, Wang XS, Yang RF, Liu C. Mobile laboratory in Sierra Leone during outbreak of Ebola: practices and implications. Sci China Life Sci, 2015, doi: 10.1007/s11427-015-4912-6. Goodfellow, Reusken and Koopmans. Laboratory support during and after the Ebola virus endgame: towards a sustained laboratory infrastructure. Euro Surveill. 2015; 20(12). Bausch D. The year that Ebola virus took over West Africa: Missed opportunities for prevention. Am J Trop Med Hyg. 2015 92(2). Getting Beyond Zero: UNDP Ebola ERR Support Framework.